This is odd and random but I couldn’t help myself. I’ve been laughing at this stupid thing longer than I’d like to admit. This entry was posted on January 31, 2012 by H.E. ELLIS. It was filed under Humor and was tagged with Funny, Humor, music, ramblings, Random, thoughts. Fat Washington XD. I love these name things! We’re related! Mine is Brown Eyes Green! Jailhouse Legs Davis … Really? Yeah, I’m not exactly sure what “Jailhouse Legs” are. I found a whats your Animal name one and mine was ‘Flopsy the stubborn Rhino’ now that is funny. Oh man, I’ve got to go find that! Brown Eyes Thompkins over here. What? Wow I messed that up. Again I’m not that good at following directions. Really? To me you seem more like a Sticky Gumbo-Eyes Jenkins. If I wasn’t such a gentleman I would have something to say to that. Don’t feel bad. What’s great about this list is that you can choose one for yourself! If I were you I’d pick Melvin or Yancy. I would like to be Bald Liver Bradley. Can you arrange that for me? Hmmm…Curly Fingers Malone. I’m a gangsta!!! My WordPress persona is ‘Ugly Davis’- great for my self esteem, and my real life persona is ‘Jailhouse McGee’. How’d they KNOW about my previous Jailhouse experience?? That name sounds like it should come with a harmonica. For mine to be accurate it would have to be Raging PMS Female. I’m Blind Fingers Brown, but if my fingers are blind that means I’ll have to play my piano by ear. I think I’ll stick with Honey Feet O’Gerkin. That name sounds like bad buffet food. Boney Pickles McGee at your service. No wonder I have the blues. Do you crunch when someone bites you? Consider yourself booked for New Years Eve. It’s true. Around here the rivers of money are very damn skinny. Mighty shallow too. So you live in New Hampshire too, huh? Ugly Sugar Jones. Truer name calling has never been. I have a really ugly sugar jones. The sweet tooth of death. I stand corrected. THIS is the best name ever! Curly Eyes Jackson…. I wonder if I’m related to Michael. Maybe. But I think he’s “Girly” Eyes. I’ve decided I’m changing my real name just so I can be called Washboard Willy Jenkins. Pretty Dog Magee. That is totally accurate. Thanks! Awesome! Mine is JailHouse Green. The more Jailhouses the merrier! Sleepy Bones Parker. Dang that does have a ring to it. They do, but it’s in the phone book under Hollerin’ Lee & Legs Davis now. Pretty Lemon liver .. in honour of my gin drinking maybe? Skinny Eyes Parker… I’m picturing a guy with a hat who smokes and squints at people. Yes, very calculating….like the moment your back is turned he’ll knock you down and steal your guitar. FAT SUGAR LEE? You need to be the new Hostess Bakery! This is a table tent at a favorite local restaurant. We would sit and have fun with it while we waited for lunch. Then see how long the names stuck into the night. 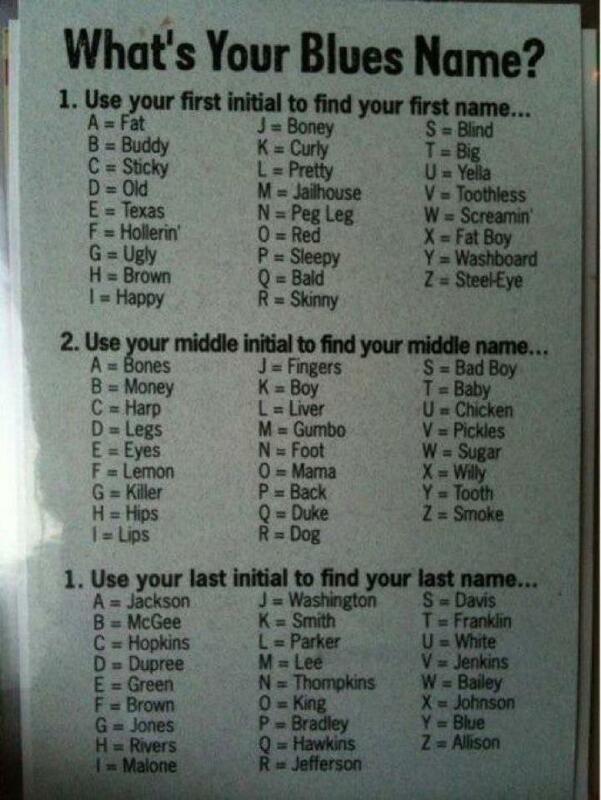 So what’s your blues name? Thanks H.E. Ellis! Mine is Big Boy Hopkins…. I guess it could be ironic, right? You sound like a Gangster! Mark today is the 3rd of February I have 30 days to the Memorial,.. I am already in over my head but frigue its a great layout and schedule for the pros. I am going to put this to work here in San Diego and Commit to the program for unconditional confidence. Many thanks. What a great name for a roadside rib joint!